Author Alvina Sullivan’s Newly Released “Touch My Heart; Stories of Inspiration” is a Collection of Short Stories About Hope. “Touch My Heart; Stories of Inspiration” from Christian Faith Publishing author Alvina Sullivan is a collection of stories that seeks to inspire readers to reach out to God. By providing stories about hope, “Touch My Heart; Stories of Inspiration” encourages the disheartened to seek the healing power of God. “Touch My Heart; Stories of Inspiration”: a collection of stories about hope that inspires faith in God. 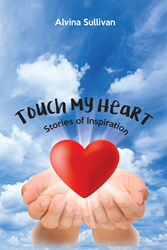 “Touch My Heart; Stories of Inspiration” is the creation of published author, Alvina Sullivan. Alvina was born and raised in Michigan until she moved to Texas at age eleven. As a teenager and young adult, she fell out of love with God. For many years, she fought with depression and various addictions. As a young single mother of two, she hit rock bottom when she turned her life back to God. She still struggles with daily life, but things look much better with God in her life. Published by Christian Faith Publishing, Alvina Sullivan’s new book offers a collection of stories filled with hope. For those who feel they have reached rock bottom and need a pick-me-up, here is a collection of good stories that can help ease the struggle. As long as people are looking for God, there is also hope for them. God is, after all, the only one who can ease the sorrows of all His children. “Touch My Heart; Stories of Inspiration” offers stories of hope that will inspire readers to talk with God. He is always there and always ready to listen. View a synopsis of “Touch My Heart; Stories of Inspiration” on YouTube. Consumers can purchase“Touch My Heart; Stories of Inspiration” at traditional brick & mortar bookstores, or online at Amazon.com, Apple iTunes store, Kobo or Barnes and Noble. For additional information or inquiries about “Touch My Heart; Stories of Inspiration”, contact the Christian Faith Publishing media department at 866-554-0919.